ÑAÑA, Peru - On Monday, the 28th day of January, the confreres of the Peru-Brazil Delegation and the Daughters of Wisdom of the Perú-Argentina-Ecuador Delegation gathered in the "San Luis de Monfort" cemetery of Ñaña to unearth and transfer the bodies of the dead missionaries to another cemetery in this land of mission. 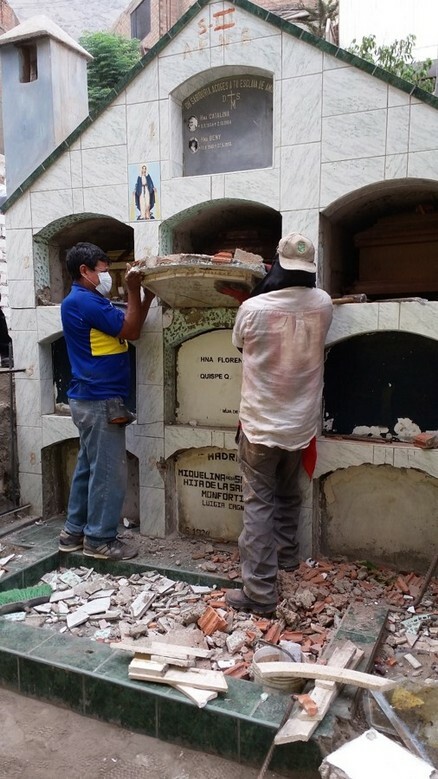 The Ñaña cemetery, already small and a victim of an abusive urbanization, has led the Montfortian family to look for a more dignified burial for our dead and more space so that one day, the bodies of the missionaries can rest and be visited in the same place. The event was observed in an atmosphere of prayer and joy. It was indeed an emotional experience, reminiscing the works of the missionaries who preceded us. • Little Maristella, the daughter of a lay missionary couple who worked in Peru. • Sister Florencia Quispe, Peruvian.